Well that's it for this week! Hope you all have a good Halloween and a good Blizzcon! Stay safe at both! And make sure to check out the final Halloween page this week! Oooh, nice, I recognize about 5 others in the picture! And maybe a fourth. Who's the one in the cow-ghost costume? I recently binged through Daughter of the Lilies so I want to say that it's Thistle, but I could be very wrong. No, Arua nothing has happened to your powers, else you would have reverted to Old Arua. Pick up on the lesson The Light is trying to teach you here. P.S. 6 more comics to # 1,000. I recognize Rotahg, from Tauren it Up, who looks completely unimpressed to be dressed up like an angel. 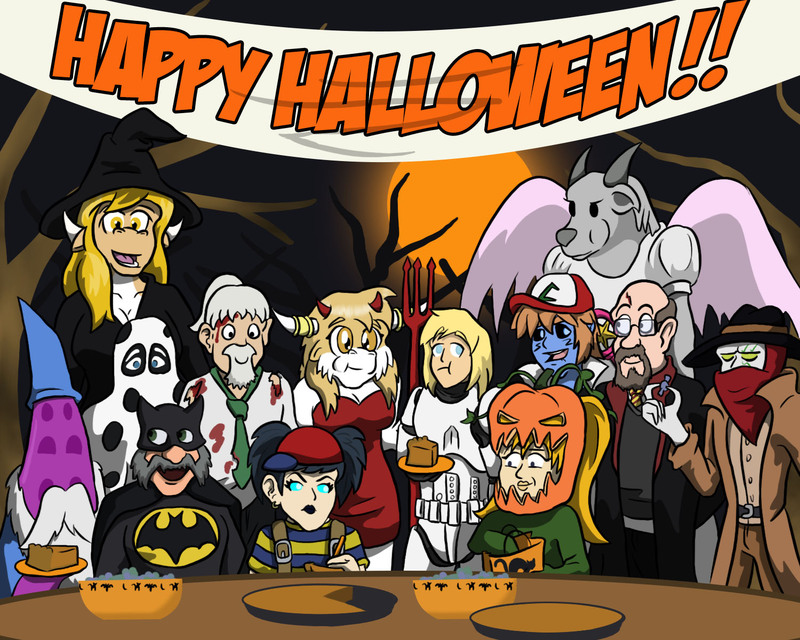 I see Trig down in the front row, but don't recognize the character she's supposed to be dressed as. Arua and Tallia for sure, want to say I've seen the lady in the punpkin but memory escapes me. The lady in the pumpkin is Bandit from Guilded Age. Great story and it keeps me wanting more. Looking at past Halloween pages, which are awesome, you've really outdone yourself this year. Have a fun and safe Halloween. What are you dressing up as?